Microsoft has released the official ISO images for Windows 10 which integrates with Windows 10 Anniversary Update. The Windows 10 Version 1607 Build 14393 ISO images can be used to perform an in-place upgrade to latest version of Windows 10, or can be used to perform clean install to latest version of Windows 10, eliminating the need to download and install Windows 10 Anniversary Feature Update (Version 1607) later on. Officially, there are at least 2 ways which users can legitimately download genuine untouched and unmodified Windows 10 Version 1607 ISOs, via Windows 10 Media Creation Tool and Windows 10 ISO download page. Microsoft has updated the Windows 10 Media Creation Tool to download Windows 10 Version 1607 (Build 14393.0 as of published date). Media Creation Tool allows user to build an ISO image, and/or create a DVD or USB flash drive installation media. Refer to the guide on Windows 10 Media Creation Tool to download Windows 10 ISOs. So, the trick is by changing the user agent that the web browser sends to Microsoft’s server to trick it to believe that you’re using a Linux, Mac OS, iOS, Android and other non-Windows device. However, there is a simple trick that forces Microsoft to not only offer Windows 10 ISO disc images for download, but also all ISO disc images for Windows and Microsoft Office that are available for free download. Commonly known as TechBench, but it actually works on any official Microsoft ISO download pages. 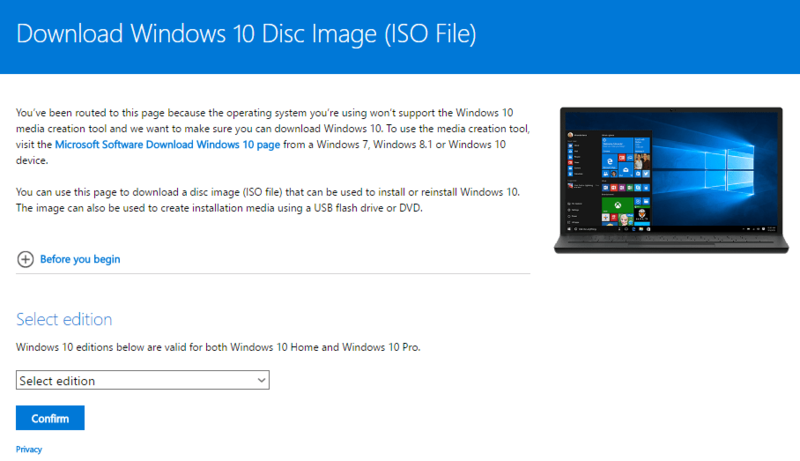 Refer to the guide to download official Windows ISO disc images from Microsoft. Microsoft has released the official Windows 10 Client Insider Preview Build 14393, which is essentially the Windows 10 Version 1607 aka Windows 10 Anniversary Update. Although it’s labelled as Insider Preview, but the ISO images downloaded for build 14393 will be exactly the same with the ISO made available from GA (general availability) release. You need to be a member of the Windows Insider program in order to download from above pages. These Windows 10 Version 1607 ISO disc images, when fully downloaded, will have the same file hashes with ISOs downloaded from MSDN (Microsoft Developer Network) Subscriber Downloads and Microsoft Volume Licensing Service Center, where they are de-facto ISOs and highly sought after long before Microsoft made available official ISO disc images of Windows and Microsoft Office for public download.